This system was designed for in-line part inspection and gaging in harsh environments. The inspection system was fully enclosed with 1/4" thick plastic panels sealed around seams. The inside of the cabinet is purged with clean dry air to provide positive pressure to prevent migration of dust and other contamination from the harsh environment around the machine into the inspection area. The system could be supplied with high resolution Cognex or Keyence machine vision inspection systems and/or Keyence precision lasers for gaging. A pass through conveyor is used to move parts into position for inspection or gaging. A reject device pushes bad parts off line down a chute to customer's bin. Good parts flow through to the next station. 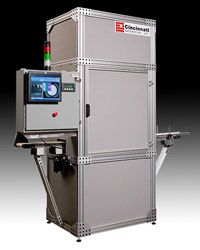 Typical options include data collection PC, and full box control packing conveyor.